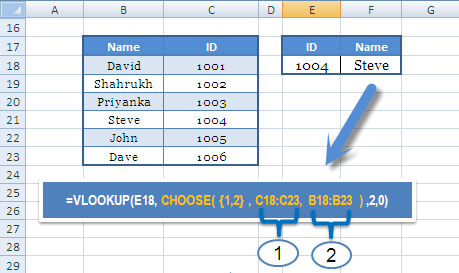 The CHOOSE function commands excel to activate a value or formula in a list of values or formulas. Download the workbook used in the examples shown above. Condition 1 : If a value in cell B6 is 1, we want the function to place "Apple" in cell C6. Condition 2 : If a value in cell B6 is 2, we want the function to place "Orange" in cell C6. Condition 3 : If a value in cell B6 is 3, we want the function to place "Mango" in cell C6. If B6 = 1 , it returns Apple as it is the first value in list. If B6 = 2 , it returns Orange as it is the second value in list. If B6 = 3 , it returns Mango as it is the third value in list. VLOOKUP looks for a value in the leftmost column of a table, and then returns a value to the right of that column. If one wants to look up a value in one column and return values to the left of that column. For example, 75 is in cell L18. We want the function to return grade against it in cell M18. 0 Response to "Excel CHOOSE Function and Its Uses"